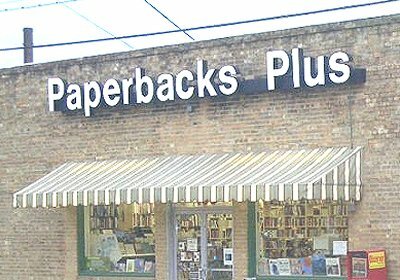 Paperbacks Plus is a general used bookshop located in the first block East of the Square at Galloway in Downtown Mesquite and one block west of Mesquite High School. & Sunday: 11:00 a.m. - 7:00 p.m. If you are in the D/FW area and have items with which you are finished, you can pay us for up to half of our normal price with trade-ins which are in good condition and for which we have some use. The rates allowed for your materials will vary from 50% of our expected selling price down to a nominal value depending on our judgement of our supply and demand. We welcome email and phone inquiries for specific titles. Note: If you have a gift certificate or trade credit on file at either of our other two Lucky Dog Books locations you may use it here in Mesquite at Paperbacks Plus just as there. You are also welcome to use your credit from trade-ins here in Mesquite at each of the other two Lucky Dog Books locations in East Dallas and Oak Cliff. To reach this store from LBJ/635, take the Military Parkway exit and go East. Once you leave the freeway, it will be about a mile or so until the first traffic light. We are in the very next block on the right hand side of the street. If you go as far as the high school you have gone too far and will need to circle back to Galloway via Main Street (one way running WEST) and then take a left on East Davis St. The bookstore will be on your right. For more information please visit our Lucky Dog Books homepage or click here to send us an email. *Many thanks to Kenny Green at The Mesquite News for running this story about our 40th Anniversary which we celebrated on Saturday, June 28, 2014. This page last updated July 4, 2018.